Lytham Ladies hockey team bounced back from conceding two early goals to beat a spirited Clitheroe and Blackburn Northern 5-2 and climb to third in North division two. Keeper Lauren Lockhart played on despite a neck strain to help the home side turn the tide at AKS in this final match of 2017. As Lytham settled, Amy Barrow crashed a shot home to haul them back into the game at 2-1. Amy Barrow and Tasha Webster began to impose themselves in attack as Lytham sacrificed defenders. They drew level with a great penalty corner by Emily Adams and were soon two clear thanks to the scoring instincts of Georgia Perkins. A fifth goal followed. Captain Livvie Hatvin can be proud of the 20 players who have represented the team so far, and who have matched last season’s final points total by this season’s Christmas break. Lytham Men ended the year on a high as a 4-3 home win over Lancaster and Morecambe lifted thim into the top half for North Two West. Lytham started well at AKS, with strong runs down the right by Tom Evans. Tom Atkinson netted two near identical goals and Neil Mallalieu scored with a clean reverse strike. They could have had more but Shawcross had a drag-flick blocked on the line and also hit the crossbar. He was rewarded with a spectacular diving goal. However, these goals were interspersed with strikes by Lancaster to keep the outcome in doubt before Lytham emerged victorious. The break will enable niggling injuries to clear before the season resumes next month. Also at AKS, Lytham 2 followed their draw with Fylde to record only their second win of the season at home to Preston 5. Lytham started well and their pressure resulted in the opening goal only for Preston to equalise against the run of play. Mike Gannon put Lytham back in front at half-time but they conceded a second equaliser after the break. More pressure resulted in a third Lytham goal and a second win of the season which sees them jump two pointg above the visitors. Blackpool Ladies Hockey Club ended the year with a 4-2 derby victory away to bottom club Lytham 3 in Lancashire Central division two. Both sides had short corner opportunities they couldn’t convert in the early stages at Ansdell Arena, where Blackpool gradually pushed Lytham back but struggled to get past a solid defence. They finally made the breakthrough five minutes before half-time, when Annabelle Counsil’s strike rewarded Blackpool’s effort and determination. The goal fired Blackpool up for the second half and Lara Cherry scored twice from short corners to make it 3-0. Winless Lytham didn’t give up and pulled one back through Sally Stone from Jess Mangnall’s pass only for the well-placed Katie Ansell to score Blackpool’s fourth from close range. Lytham had the final say when Jess McIntyre slapped in a rebound after a fine run down the right wing by Lucy Knowles. Katie Holt had an excellent debut in goal for Lytham but could prevent a result which sends Blackpool into the Christmas break in fifth spot. Rossall Ladies hockey team end the year unbeaten and sitting pretty at the top of the table after a 2-0 win over Fylde 3. 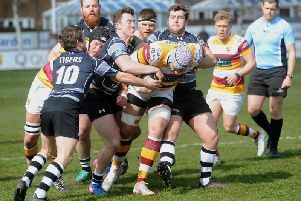 The top two in the Lancashire Central division one vied for the Christmas number one spot and Fylde, with a squad of 15 players, started strongly. Rossall struggled to get a foothold but defended well and reached half-time with the score at 0-0 thanks to fine goalkeeping by player of the match Eleanor Garstang. Rossall began to create more chances in the second half and took the lead 15 minutes in, when Jill Wilson scored after a powerful run down the right by Jasmine Wright. Rossall soaked up the Fylde pressure and were rewarded with a second goal. This time Wilson was the provider and Sam Evans slotted past the advancing keeper.